When I saw this one a while back, I knew, as a professed lover of all things Jane, that I had to eventually read it. Thankfully, my delightful gift exchange partner, Holly, made that eventually sooner rather than later. And the answer is: yes, all of the above. 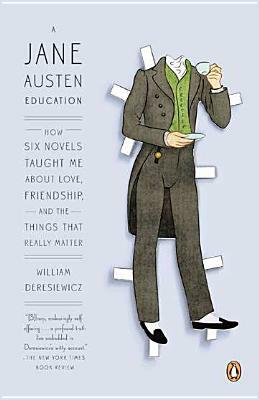 Deresiewicz weaves his personal story of a 26-year-old, single, angsty Jewish male with analyses of all six of Austen’s books, giving each book a theme that helps him through a time period in his life. He doesn’t go chronologically with her works, but rather in the order that he read them, and with what fit with what period. It’s a book about Austen, yes, but it’s also a book about Deresiewicz’s growth as a person, and the role that Austen played in that. Having read all the novels many times (though not recently; one of the things I realized while reading this is that it’s been a while since I’ve visited with Austen, and “a while” is too long), he didn’t really say much that I didn’t know. I’m not sure I’m going to look at her novels in a new light now, or anything like that. Perhaps, if I were less than an avid fan, I would have (I also want to give this to the guy at work who disdains all “chick fiction”, calling it “fluffy” and beneath his notice). At the very least, Deresiewicz succeeded in reminding me why I adore Austen. For me, this was a delightful romp through familiar land: watching someone come to a realization that Austen and her small, domestic dramas and comedies really do hold valuable lessons for the rest of us, even 200 years later. I am thinking now that it has been a rather long time since I've re-read Austin. Except, of course, for certain bits of P. and P., which I read about every year…. I've been wondering about this book – now I'm going to put it on my tbr list. And I'm thinking, too, that it's high time I started rereading Austen. Charlotte, Belle: I agree! This book definitely left me with the sense that it's been too long since I've read any Austen. Time to rectify that. I first came across Jane Austen as a teenager. I enjoyed her then but always felt that she lacked a certain edge. As an adult I still enjoy her and realise her edge is there, it's just very subtle, but sharp nonetheless.